>> The Gospel According To D. Boon posits an axis bridging the chasm between New Wave and The Truth, along which we reckon the lion's share of unremarkable rock and roll acts lies squarely in the middle. However, fans of Boston indie rock can be proud of the fact that the city is home to a small number of acts whose songwriting situates them directly on the dot representing pure Truth. Chief among these -- along with Clicky Clicky fave bugcore heroes Krill, it should be noted -- is Bad History Month, the present solo iteration of the visionary duo Fat History Month led by songwriter Jeff Meff. Bad History Month's deconstructed cow-punk expertly renders wholly engaging and artful songs that are heavy on quiet, shuddering revelation. The preview track to the band's forthcoming split EP, "Staring At My Hands," is a prime example of the breathtaking results Mr. Meff can achieve by creatively arranging deceptively minimal sonic elements (drums, guitars, piano, feedback, voice) around startlingly conscious musings on mortality and solitary existence. Lyrics like "nervous outside of a bar, focus on a single star until it disappears, reaching for the comfort of just how small things are" splays open the idea of our intrinsic alienation like a butterfly pinned to a mounting board. Mr. Meff, like Krill's Jonah Furman, seems to conjure songs and articulate ideas from directly within the listener's brain, which is a strange point to make, but it's the best way we can presently think of to describe just how real, pure and true his musical ideas are. "Staring At My Hands" is taken from the forthcoming Famous Cigarettes split EP, which contains 40 minutes of new music from Bad History Month and Dust From 1,000 Yrs and will be released by Exploding In Sound as a limited edition cassette and digital download June 10th. The split will also be issued as an LP Aug. 4 via Limited Appeal; the pressing is on "mystery color" vinyl and comes packaged with a Colorful Camel poster, which in our estimation doubles the potential copyright infringement liability associated with this release. 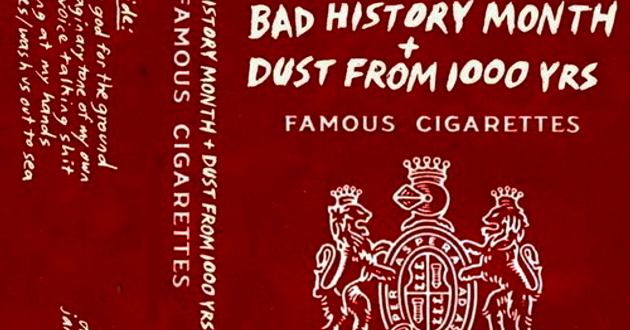 Bad History Month plays an EP release show June 9 show at Charlie's Kitchen in Cambridge's Harvard Square, and then embarks on a massive, two-month nationwide tour that wraps on or around Aug. 5. The dates are all posted right here (scroll down); all of that seems so very far away, but just think of the fruitful hours ahead you have to ponder your own fragile mortality? Stream "Staring At My Hands" via the Soundcloud embed below, and then pre-order Famous Cigarettes in your format of choice right here. We last wrote about Bad History Month -- then Fat History Month -- here a year ago February. >> It's been more than a decade since Darren Hayman fronted the popular UK indie pop concern Hefner, but that distinction still follows him around despite a thriving solo career that is already 10 albums deep. Another sort of notoriety is at the heart of Mr. Hayman's latest solo collection, the minimal experimental synthesizer opus Wembley Eiffel Tower. The album pays tribute to the quixotic 19th century innovator Sir Edward Watkin, an Englishman who -- among other things -- attempted to erect a tower that would rival Paris' Eiffel Tower while drawing people to London's Metropolitan train line. The construction of the edifice was ultimately a failure spectacular enough to attract both some amount of ridicule and the attention of Mr. Hayman, who dedicates his 47-and-a-half minute synth composition to "Watkin's Folly." The most interesting thing about Wembley Eiffel Tower is that it is, in effect, the sound of an analogue modular synthesizer playing itself. Hayman employed such electronic curiosities as a programmable scale generator and clock divider to instruct the machine how to behave given certain conditions; he then recorded the results uninterrupted to six tracks, applied some reverb and mixed them. The result is a peaceful but mildly sinister meditation that recalls the soundtracks of certain British television programming that made its way to American public broadcast networks during our youth (the one thing we can identify for certain is "Dr. Who," but we are sure there are many other programs that fit the bill). Whatever your reference point for it, Wembley Eiffel Tower's attraction is a persistent cool vibe that at one and the same time feels dreamy and functional. Wembley Eiffel Tower will be released by Glass Reservoir Monday in a limited edition of 100 compact discs with a handmade cover carved by Mr. Hayman as well as digital download; we just looked and the CDs sold out on pre-orders, so NO SOUP FOR YOU. But you can stream the entire recording via the Soundcloud embed below, and pre-order the download right here.